The Beatles and Rolling Stones still the music industry's biggest earners . Beatles Radio: The Beatles, Solos, Covers, Birthdays, News The Fab 4 and More! THE Beatles and Rolling Stones are still fighting it out to be the biggest live act in the world. 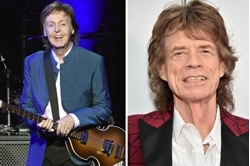 Sir Paul McCartney and Sir Mick Jagger’s bands are the music industry’s biggest earners. Figures for 2017 show the veterans out-performed singers less than half their age including Ed Sheeran. Jagger, 74, and his band raked in £116 for every person at their 14 sold-out stadium shows. And Beatles legend Macca, 75, is only just behind them, pocketing £108 per seat for 36 performances. But despite starring on an 111-gig tour, Sheeran, 26, bagged an average fee of just £60.